Have you ever planted a new lawn only to be disappointed in how it grew in? Watering a new lawn is very different from watering grass in an established lawn. Many lawns are lost at the initial watering stage. Whether you have planted seed or laid sod, lawn irrigation must be done properly for best results. For the seeds to germinate, the soil needs to be consistently moist and soil temperatures must be in the right range. Germination times vary with different species, but most lawn seed will germinate within 5 to 21 days. When watering a new lawn, the best way of keeping the seed moist is by lightly sprinkling the seeded area of the lawn at least two to three times a day. Care must be taken to ensure the soil doesn't dry out. The seeds could perish if they are allowed to dry once the germination process has begun. Your lawn may require more frequent watering depending on the soil type, weather, temperature, or wind. Sandy soils retain less water than loamy or clay soils. Remember, the best time for planting cool season grasses is in the fall and warm season grasses are best planted in the spring. Click on the link for detailed information on Grass Seed Germination. Seeing the steps of grass seed germination will reinforce why grass seed should be irrigated in a certain way. Step 1: Prepare the soil to be seeded. If overseeding an existing lawn, cut the grass low and remove the clipping before seeding. If you have more than 1/2 to 3/4 inch of thatch, consider using a dethatcher first and remove the debris. This is because the seeds need to come in contact with soil. 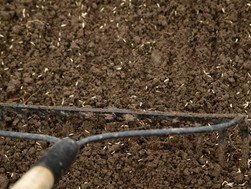 If planting grass seed on bare soil or in sparse grass, loosen the top half inch of soil with a steel rake so the seed can be easily raked in after spreading. You might include a "starter" fertilizer at this point, if needed, based on the results of a soil test. Many people will wait 5 to 14 days after seeding before applying the fertilizer. This way the fertilizer begins working about the time the seeds begin to germinate. Remember that different lawn grass seed varieties vary greatly in the time required for germination. Phosphorus is relatively immovable in the soil and a starter fertilizer ensures there is phosphorus within reach of the young seedlings. Therefore, starter fertilizers will contain higher amounts of phosphorus (middle number on a fertilizer bag) than regular fertilizer. Step 2: Spread and rake the seed into the soil so it is lightly covered. Use the heavy rate listed on the bag when planting grass seed in bare soil and lighter rates when overseeding an established lawn. Most seed can be spread using a rotary or drop fertilizer spreader. Before you begin watering a new lawn, always check the bag to see how deeply your seed should be covered with soil. Most need just a very light covering of soil and over 1/2 inch is too much. Exceptions include buffalo grass seed. It should be as planted as deep as 1 inch. When raking seed in, you will always have some seed showing on the surface which is okay. It can still germinate if in contact with the soil, but covering ensures perfect all around contact. Step 3: Irrigate the soil daily, at least twice a day, but possibly more. Try not to let the soil completely dry out. If your seed is planted in bare soil, do not soak or flood your lawn. When watering a new lawn, use just enough water to keep the soil moist at seed depth. Standing water or prolonged heavy rain could ruin some of the seed or possibly wash the seed away. If overseeding a lawn where you have established grass, be sure to keep the seed moist by watering lightly twice a day. Occasional deep watering is okay to maintain grass health. The existing grass will help keep the seed in place, shade the soil, and slow evaporation. Step 4: Once the seed has sprouted continue watering lightly, but allow the soil to dry slightly before watering again. At the seedling stage, it is even more critical not to repeatedly saturate the soil. Persistently wet soil can lead to serious root diseases, such as Pythium Blight, that can kill the roots. Very humid weather often has greater disease problems than dry weather. Step 5: When the grass is a couple inches tall cut back on water to once every two to three days, depending on the temperature. Tiny seedlings can still suffer if the temperature spikes and the soil dries out. Soil dries faster in hot, arid environments than humid environments. Step 6: Once the grass reaches the cutting height for your particular grass type begin watering deeply, but less often, so the soil is wet to a depth of four inches. After watering, don't water again until the grass begins to show signs of stress. This trains the roots to grow deeper into the soil to reach available water and nutrients. Important Hint: Grasses are "monocots", meaning they emerge from the soil as a single blade. This single blade develops into a larger plant, but it will take time. Don't expect to have a thick lawn in a few weeks. It takes at least one full year and often two years to get thick, healthy turf when starting with seed on bare soil. Additional tips for planting and watering a new lawn: If you need to add soil or organic matter to the lawn, do it before planting your grass seed. This allows you to lightly rake the seed in instead of smothering the seed under too much soil. Irrigation should immediately follow seeding. A pull behind dethatcher (pulled behind a riding mower) will help loosen soil and is easier on the body. They can be weighted with sand bags or cinder blocks for deeper penetration. You can purchase one at many farm stores or home and garden outlets. While there are a few absolutes when watering a new lawn, it's alright to adjust as needed keeping with sound cultural practices. The wonderful thing about sod is that it can provide you with an instant lawn. The rules for watering a new lawn are basically the same for seed and sod, with just a little variation. When sod is harvested, the roots are cut making it extremely important to lay it as soon as possible. The faster you get water on the sod, the better. Any soil preparation work should be done before the sod arrives. Depending on the thickness of your existing lawn, you may need to kill the existing grass before the new sod arrives. It may take a few weeks for the old grass to completely die back. Some contractors are placing the sod directly over the old grass without killing it first with reportedly good results. I have not tired it myself. The sod laid on top will suffocate the old grass and will be completely killed within a few weeks. You may get some grass braking through along seam gaps or thin areas. I will have to research that more. Make sure the ground is leveled where the sod will be placed. Fill or remove any large dips and hills. Large rocks near the surface should also be removed. If not, the grass that rests over a large rock will likely be stressed or could even die. The sun can heat the rock and any roots that do begin to grow will perish. Before the sod arrives is the time to make any adjustments to the soil as indicated on a soil test. Soil pH can be corrected using limestone or sulfur, depending on what is needed. Once the sod is laid, use a lawn roller to press the sod down to ensure good contact with the soil. Next, water the sod frequently, so it will not dry out. Remember, freshly cut sod has no roots. Therefore, sod will have to be irrigated as often as necessary until the roots grow in and the sod attached firmly to the ground. As the roots develop, the grass can be irrigated less frequently, but more deeply. Keep in mind that not all areas will develop roots at the same rate, so watch for any signs of drought stress. Be careful about watering grass late evening or at night, especially with high humidity. This creates a problem with the lawn staying damp for too long. Most diseases need prolonged moisture as a necessary ingredient for the disease to begin. When watering a new lawn or mature lawn, irrigate early to late morning. Try not to allow the soil to go into the evening in a very wet condition. These basics of sodding and watering a new lawn should help you get your new lawn established. If you need additional help in watering a new lawn, either seed or sod, please write to me using our contact form. The use of organic lawn fertilizer has increased in recent years. Success with organics requires knowledge of how they work and an understanding of your grass’ needs. Climate Zones of the U.S. Unlike some plants, you can't bring your grass indoors when conditions don't favor it. Choosing the right grass for your climate zone is important. Lawn weeds compete for space, nutrients and water and disrupt the uniform appearance of your lawn. Fortunately, many methods are used to control them.